From kids parties to large shows, call Baja Face Painting for your next event! We're professional, great with children, and use non-toxic, water-based paints that are easy to wash off. Baja artists have added colorful flair to many recent events such as the Boston GreenFest, Down:2:Earth Expo, Borders Dedham Grand Opening, Magic Beans Anniversary Celebration, the New England Flower Show, the New England Motorcycle Show, World of Wheels, and many others. References are available. 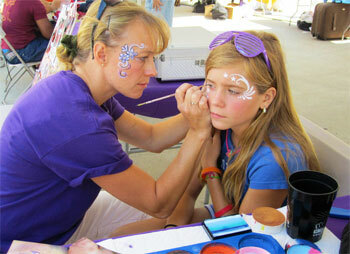 Baja face painters arrive at your location or event with all their own equipment. We only ask that you provide two chairs, a table, fresh water, and a well-lit space. We are also available for large-scale functions and corporate promotions. If you are organizing an event, please contact us for details! Please Contact Us for more information on having Baja at your next event! See our recent review on Boston Mamas.com! And read our great write-up by Magic Beans!